Schematic turbofan engines. 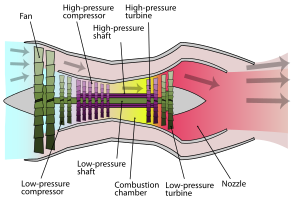 The high-bypass engine (top) has a large fan that routes much air around the turbine; the low-bypass engine (middle) has a smaller fan routing more air into the turbine; the turbojet (bottom) has zero bypass, and all air goes through the turbine. Turbofan engines are usually described in terms of bpr, which together with engine pressure ratio, turbine inlet temperature and fan pressure ratio are important design parameters. In addition bpr is quoted for turboprop and unducted fan installations because their high propulsive efficiency gives them the overall efficiency characteristics of very high bypass turbofans. This allows them to be shown together with turbofans on plots which show trends of reducing sfc (specific fuel consumption) with increasing bpr. Bpr is also quoted for lift fan installations where the fan airflow is remote from the engine and doesn't physically touch the engine core. Bypass provides a lower fuel consumption for the same thrust, measured as thrust specific fuel consumption (grams/second fuel per unit of thrust in kN using SI units). Lower fuel consumption that comes with high bypass ratios applies to turboprops, using a propeller rather than a ducted fan. High bypass designs are the dominant type for commercial passenger aircraft and both civilian and military jet transports. Business jets use medium bpr engines. Combat aircraft use engines with low bypass ratios to compromise between fuel economy and the requirements of combat: high power-to-weight ratios, supersonic performance, and the ability to use afterburners. If all the gas power from a gas turbine is converted to kinetic energy in a propelling nozzle, the aircraft is best suited to high supersonic speeds. If it is all transferred to a separate big mass of air with low kinetic energy, the aircraft is best suited to zero speed (hovering). For speeds in between, the gas power is shared between a separate airstream and the gas turbine's own nozzle flow in a proportion which gives the aircraft performance required. The first jet aircraft were subsonic and the poor suitability of the propelling nozzle for these speeds due to high fuel consumption was understood, and bypass proposed, as early as 1936 (U.K. Patent 471,368). The underlying principle behind bypass is trading exhaust velocity for extra mass flow which still gives the required thrust but uses less fuel. Frank Whittle called it "gearing down the flow". Power is transferred from the gas generator to an extra mass of air, i.e. a bigger diameter propelling jet, moving more slowly. The bypass spreads the available mechanical power across more air to reduce the velocity of the jet. The trade off between mass flow and velocity is also seen with propellers and helicopter rotors by comparing disc loading and power loading. For example, the same helicopter weight can be supported by a high power engine and small diameter rotor or, for less fuel, a lower power engine and bigger rotor with lower velocity through the rotor. To see the influence of increasing bpr alone on overall efficiency in the aircraft, i.e. sfc, a common gas generator has to be used, i.e. no change in Brayton cycle parameters or component efficiencies. Bennett shows in this case a relatively slow rise in losses transferring power to the bypass at the same time as a fast drop in exhaust losses with a significant improvement in sfc. In reality increases in bpr over time come along with rises in gas generator efficiency masking, to some extent, the influence of bpr. Only the limitations of weight and materials (e.g., the strengths and melting points of materials in the turbine) reduce the efficiency at which a turbofan gas turbine converts this thermal energy into mechanical energy, for while the exhaust gases may still have available energy to be extracted, each additional stator and turbine disk retrieves progressively less mechanical energy per unit of weight, and increasing the compression ratio of the system by adding to the compressor stage to increase overall system efficiency increases temperatures at the turbine face. Nevertheless, high-bypass engines have a high propulsive efficiency because even slightly increasing the velocity of a very large volume and consequently mass of air produces a very large change in momentum and thrust: thrust is the engine's mass flow (the amount of air flowing through the engine) multiplied by the difference between the inlet and exhaust velocities in—a linear relationship—but the kinetic energy of the exhaust is the mass flow multiplied by one-half the square of the difference in velocities. A low disc loading (thrust per disc area) increases the aircraft's energy efficiency, and this reduces the fuel use. The growth of bypass ratios during the 1960s gave jetliners fuel efficiency that could compete with that of piston-powered planes. Today (2015), most jet engines have some bypass. Modern engines in slower aircraft, such as airliners, have bypass ratios up to 12:1; in higher-speed aircraft, such as fighters, bypass ratios are much lower, around 1.5; and craft designed for speeds up to Mach 2 and somewhat above have bypass ratios below 0.5. Turboprops have bypass ratios of 50-100, although the propulsion airflow is less clearly defined for propellers than for fans and propeller airflow is slower than the airflow from turbofan nozzles. ^ a b Ilan Kroo and Juan Alonso. "Aircraft Design: Synthesis and Analysis, Propulsion Systems: Basic Concepts Archive" Stanford University School of Engineering, Department of Aeronautics and Astronautics. Quote: "When the bypass ratio is increased to 10-20 for very efficient low speed performance, the weight and wetted area of the fan shroud (inlet) become large, and at some point it makes sense to eliminate it altogether. The fan then becomes a propeller and the engine is called a turboprop. Turboprop engines provide efficient power from low speeds up to as high as M=0.8 with bypass ratios of 50-100." ^ a b Nag, P.K. "Basic And Applied Thermodynamics" p550. Published by Tata McGraw-Hill Education. Quote: "If the cowl is removed from the fan the result is a turboprop engine. Turbofan and turboprop engines differ mainly in their bypass ratio 5 or 6 for turbofans and as high as 100 for turboprop." ^ Paul Bevilaqua : The shaft driven Lift Fan propulsion system for the Joint Strike Fighter page 3. Presented May 1, 1997. DTIC.MIL Word document, 5.5 MB. Accessed: 25 February 2012. ^ Bensen, Igor. "How they fly - Bensen explains all" Gyrocopters UK. Accessed: 10 April 2014. ^ a b Philip Walsh, Paul Fletcher. "Gas Turbine Performance", page 36. John Wiley & Sons, 15 April 2008. Quote: "It has better fuel consumption than a turbojet or turbofan, due to a high propulsive efficiency.., achieving thrust by a high mass flow of air from the propeller at low jet velocity. Above 0.6 Mach number the turboprop in turn becomes uncompetitive, due mainly to higher weight and frontal area."